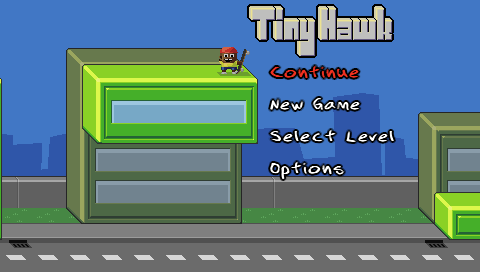 Tiny Hawk out on iOS! 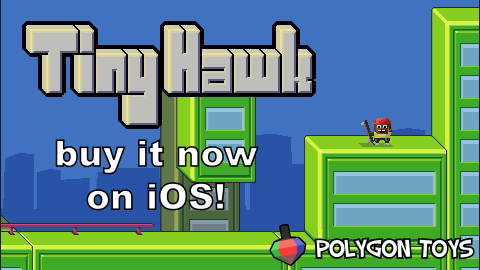 Tiny Hawk is now out for iOS devices on the iTunes App Store! Tiny Hawk is now 1.49€ on European PSN Store! Go get it if you haven’t already! It seems like one of the things about which the game got criticized early on was the price or the short length of it, and I think that was probably justified criticism. I do personally think the game is worth 3 euros, but I have to admit that compared to all the great games that are cheaper than that, 3 euros is not a competitive price. I wish I could fix this problem the other way: by updating and extending the game. Alas, the PS Minis model does not allow that. I can do bugfixes and tweaks, but that’s about it. No new content. I think that’s quite unfortunate. I hope this price drop makes the game a better product, and more people get to play it. 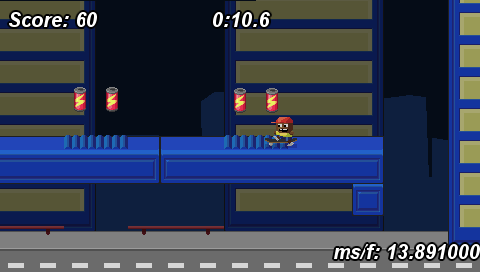 Now, if you don’t have a PlayStation, I’m working on an iOS port, and I’m hoping to release that very soon. Tiny Hawk is out on EU PSN! Tiny Hawk now has a European release date! It will be coming out on PSN on January 4th 2012! Mark your calendars! The game is rated PEGI 3, so it’s fun for all ages! Full list of release countries after the break. Australia, Austria, Bahrain, Belgium, Bulgaria, Croatia, Cyprus, Czech Republic, Denmark, Finland, France, Germany, Greece, Hungary, Iceland, India, Ireland, Israel, Italy, Kuwait, Lebanon, Luxembourg, Malta, Netherlands, New Zealand, Norway, Oman, Poland, Portugal, Qatar, Romania, Russia, Saudi Arabia, Slovakia, Slovenia, South Africa, Spain, Sweden, Switzerland, Turkey, United Arab Emirates, United Kingdom, Ukraine. Tiny Hawk has been submitted! Good news! 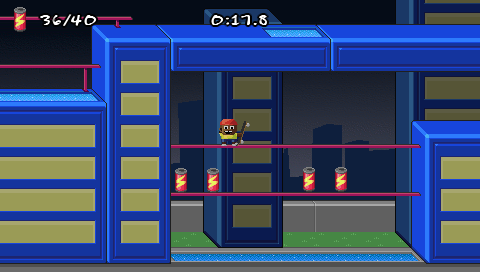 Tiny Hawk has now been submitted to Sony Computer Entertainment of Europe. It will need to go through technical quality assurance tests, but if it passes, the game should be out on December 21st. That’s not official yet, but I’m really hoping that will be the date. I will let you know when I have confirmation on it. I’m calling it “Pumpkin Slice”. I think it’s all right for having been made in zero hours. Click on the screenshot above to play. Controls are left/right/X/C. X jumps, C slices. It’s pretty difficult, although it’s also easy to cheat, and the game doesn’t actually stop even though it says “game over”. ;) If I fixed that stuff, it would be really hard. Update: Made a quick post-jam version of the game that is a bit more sensible in that you can’t cheat, you can’t move outside the play area (and neither can the pumpkins) and when the game ends, you stop getting points. 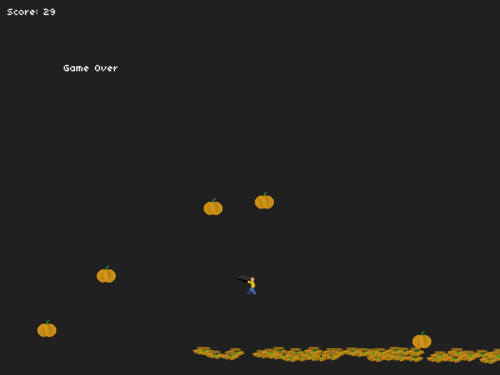 I also added a double jump move to make it easier to reach high-flying pumpkins. I also got rid of the dark grey background. 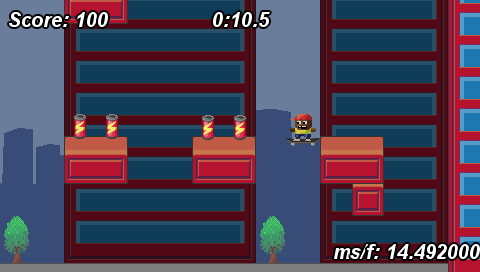 Click the screenshot below to play the new version. Ludum Dare regular @Sosowski is hosting a zero-hour game jam on Twitter tonight. Sounds pretty weird, but the idea is basically that you make a game in one hour starting before the DST shift tonight, and you finish after it. This means you start and finish “at the same time”. It’s a fun idea, and it’s just one hour of my time, so I’m going to try to make something. I have a few hours to prepare myself now, so I’m going to check that I have all my software ready, open a blank project, and probably come up with a general idea for my game so that I don’t spend a lot of time on that when the jam starts. I’m thinking about making something Halloween related, but most importantly, something very very simple. Since I’m running my own business now, I have to be extra careful about my data. That means I gotta back everything up. Now, local backups are all right, but if my apartment burns down, I’m out of luck. That’s why I’ve chosen to use an online backup service. This should be pretty much a given, and most backup services do offer automated backups. That’s pretty much the whole point, I think. Some services, like Dropbox, require you to put your files in a special backup folder. This is probably fine for more casual use, and might even be better if you want to easilly control what data gets backed up, since you can move stuff in and out of that special folder. I don’t really want to have to do that though, and I have stuff that I can’t really move easilly, like my Cygwin home directory. Most backup services do offer this, but Dropbox is a significant exception since it’s pretty popular. What I mean by this is that once I’ve added my home directory to be backed up, I want the service to keep backing up any new stuff I put in there. The options that I have on the table will all do this, but I thought it was worth mentioning. Prices vary from service to service a lot. Some services charge per gigabyte, some have unlimited data, and some have tiered pricing. Backblaze might currently be the cheapest option, since they offer unlimited data for just $5 a month per computer. SpiderOak is also fairly good at $10 a month for 100 gigabytes. Jungle Disk will only charge me $3 a month as a baseline and then $0.15 a month for each gigabyte beyond the first 5, so that’s cheaper than SpiderOak until you hit about 50 gigabytes. I found this to be a problem with SpiderOak and Backblaze. SpiderOak would hog a lot of memory, which was especially a problem on my Linux server which only has a gigabyte of RAM. It seemed like the program was actually leaking memory, which is very bad indeed. Both SpiderOak and especially Backblaze also used a lot of CPU to do their work, and would interfere with regular use of my computers. I should note though, that I did this testing a while back, and Backblaze just released a new version that’s supposed to have better performance. I found that Jungle Disk does an amazing job with not hogging my CPU much at all. I’ve been running it for months now, and I haven’t really noticed any CPU usage problems with either of my computers. Memory usage however seems to be a problem on my server. It seems like there’s a memory leak that will slowly bloat up the Jungle Disk process. It’s not too fast at that though, so I could just restart it every month or so and it wouldn’t get unwieldy. This category is pretty clear cut. Pretty much all services support Windows. SpiderOak and Jungle Disk support Linux. There are also options like rsync.net and Tarsnap which are pretty much geared towards Linux users and techies in general. I would rather not use those on my Windows desktop though. Backing up your data is important, but what could be even more important is getting your data back. With Dropbox, it’s really a non-issue because of the way it works. You’ll be able to connect back to your special Dropbox folder, and it’ll still be there. If you want to restore old versions of your files though, you have to go to their website. That process could be better. The other service that’s an odd one out is Backblaze. You can download a ZIP file or have them send a DVD or a USB drive in the mail. I feel like this isn’t very elegant, although it does work, and the physical media option would be nice if your network connection is slow and you needed to restore a lot of data. As for others, I think I like JungleDisk’s restoration method the best. I can browse through my backups in any revision that I have saved, so I can easilly restore any folder or file I want from any point in time, which is very handy. SpiderOak seems to let me choose revisions of individual files, but I couldn’t figure out how to restore a specific revision of a whole folder. Dropbox: A popular choice. What I like especially is the ability to share a folder and collaborate with other people. This works especially well because Dropbox is so popular, so most people will already have it, so you don’t have to make them jump through a lot of hoops. Dropbox is somewhat more pricier than some of the other options though, and there has been some doubts raised recently about their security. I will continue using it for folder sharing when I need it though. Backblaze: Inexpensive and you get unlimited data capacity. That’s a pretty good deal. I’m not a big fan of their ZIP file based restore system though, although the option of having them send physical media is nice. SpiderOak: They seem to have a bunch of things going for them, but I had problems with CPU usage and memory usage especially on my server. The UI also seems to have some performance problems, so selecting the files to backup can be a bit more tedious than it needs to be. I do appreciate their attitude towards open sourcing their code, security, and their customer support. They also offer really good referral bonuses (free gigabyte for each friend referred, up to 50), which is nice. Jungle Disk: I’m really liking Jungle Disk so far. I’m using their Desktop version, which is great for a single user use case. The restoration utility is great, they seem very secure, and apart from the memory leak on Linux, performance has been great. They also have a network drive and syncing options, which I wasn’t really looking for, but I still like having those features for syncing files between my computers. No sharing features though, but I have my own server, Dropbox, imgur, github, bitbucket, etc. for handling that when I need to, so it’s really not a big deal. One extra honorable mention goes to Tarsnap. I actually may end up using it on my Linux server. Tarsnap is a commandline only program for $0.30 a month per gigabyte. It seems very secure, and I think it’s a better solution for a server than any of the options I mentioned. I wouldn’t use it on a desktop though, but between Jungle Disk and Dropbox I think I have that area covered. So, the overall winner of my comparison is Jungle Disk. I did look at services other than the ones I listed above, so if you’re interested in any others, let me know in the comments. I may have tried it or at least looked into it. 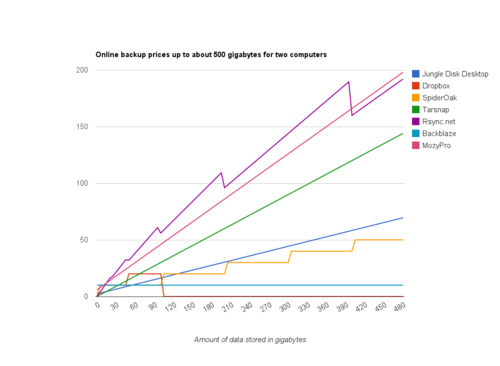 Dropbox’s pricing seems to jump up to $800 after 100 gigabytes, but that would have ruined the chart, so here it just drops to zero. Doesn’t mean that it’s free after that. 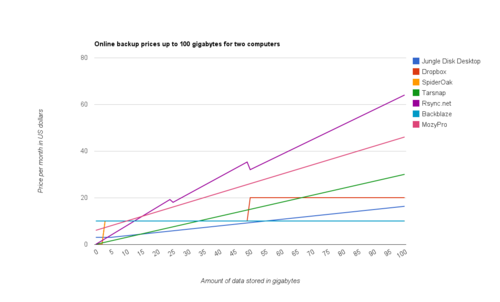 ;) It’s pretty easy to see here that if you have a lot of data, Backblaze is going to be very cost effective because they offer unlimited data. If you did have a lot of data though, I would feel like restoring them as a ZIP file would be pretty annoying. Of course you could opt to pay them to send the files on physical media ($99 for a DVD, $189 for a USB drive), which would probably be pretty convenient depending on how fast your internet connection is and how well you trust shipping your precious data in the mail, or whatever service Backblaze uses to send the data. A year back Backblaze customer support did tell me they have plans for implementing a restore function using the client program, but it doesn’t seem like that’s available yet. Update: Looks like the images ended up getting scaled down, so I have reuploaded them on imgur at full resolution. To add a little bit of a sense of progression to the game, I have created different color schemes for sets of 8 levels each. My tasklist is looking shorter now, and the game is starting to look a lot better. 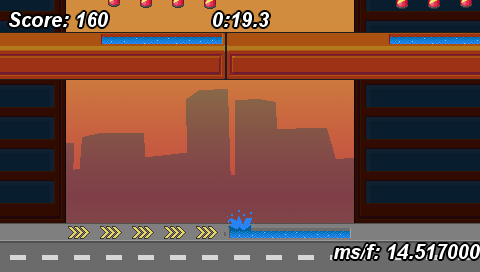 All of the necessary sound effects are in, I have a new font, the ugly UI bar is just gone, the water splash animation is in there, although I had to redraw it so it looks a bit rough in stills. It looks better in motion though. I also have an animation for picking up the cans, but it looks kinda weird so I probably need to do something about it still. 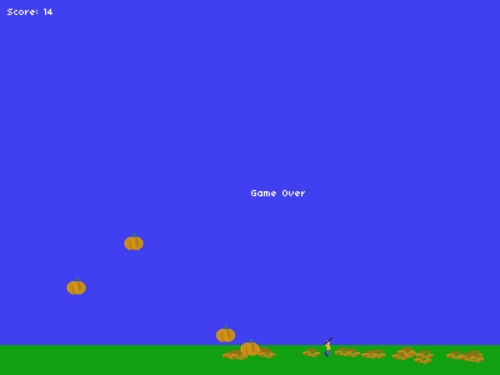 The next thing I need to do is to create a level ending screen with the player’s score shown. At the same time I will determine the time bonus calculation, although the target values will likely change after some testing. I’ll start out with some data gathered testing the Flash version. After the level end screen is done, I’ll have a calculation for the player’s score on each level, and so I can move on to writing the code for saving the player’s scores on a memory card. Only just ordered myself a compatible Memory Stick Pro Duo though, but it should arrive soon, and in the meantime I should be able to start prototyping by writing to my PC harddrive. 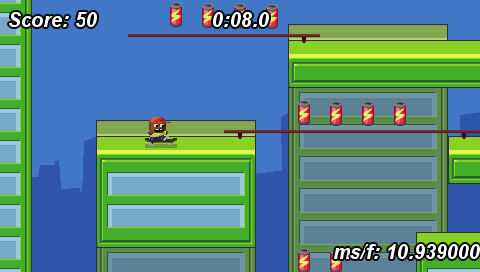 After that’s done, I should be about feature complete for the game, so what’s left then is the dreaded TRC.